The Solar Radiation map displays the current solar radiation (in Watts per square meter) observed at each Mesonet station. This map is updated every five minutes. The Total Daily Solar Radiation map displays the integrated solar radiation (MJ/m^2) for each Mesonet station for the previous day. This map is updated each night. The Total Daily Solar Radiation map displays the integrated solar radiation (kWh/m^2) for each Mesonet station for the previous day. This map is updated each night. 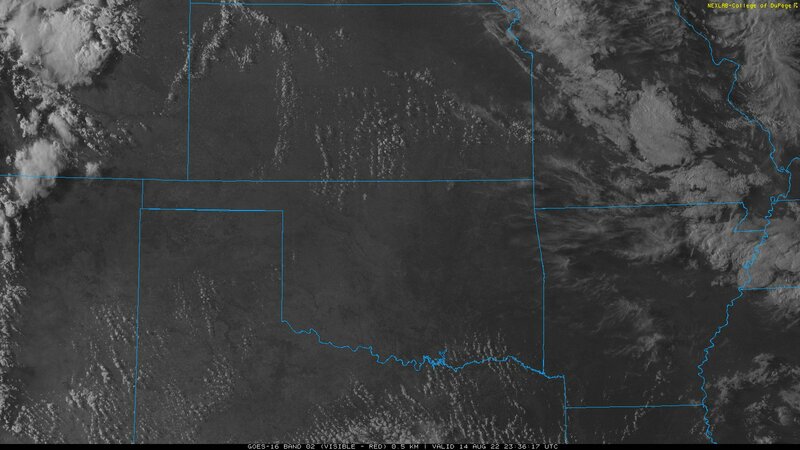 This Oklahoma satellite image displays the visible channel of the GOES-East satellite (Channel 2). During the daytime this map is useful for seeing clouds as well as features such as smoke plumes from wildfires. This image is provided by the College of DuPage and is updated every 5 minutes. The time of the image is shown in UTC time (CST = UTC - 6 hours; CDT = UTC - 5 hours). This regional satellite image displays the visible channel of the GOES-East satellite (Channel 2). During the daytime this map is useful for seeing clouds as well as features such as smoke plumes from wildfires. This image is provided by the College of DuPage and is updated every 5 minutes. The time of the image is shown in UTC time (CST = UTC - 6 hours; CDT = UTC - 5 hours). 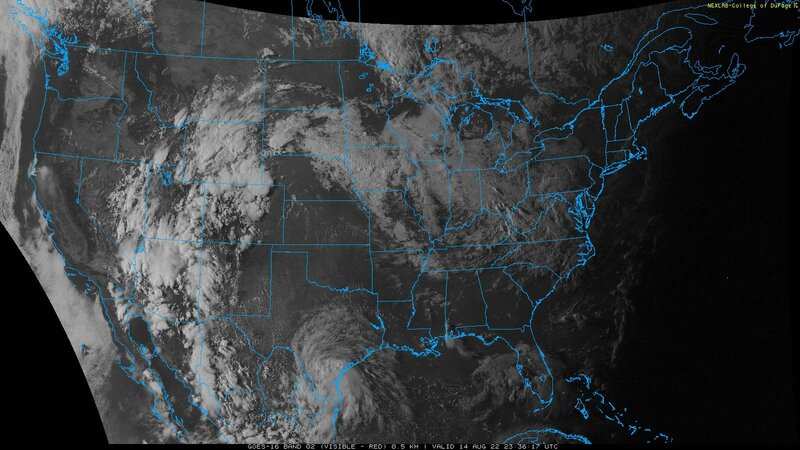 This national satellite image displays the visible channel of the GOES-East satellite (Channel 2). During the daytime this map is useful for seeing clouds as well as features such as smoke plumes from wildfires. This image is provided by the College of DuPage and is updated every 5 minutes. The time of the image is shown in UTC time (CST = UTC - 6 hours; CDT = UTC - 5 hours). 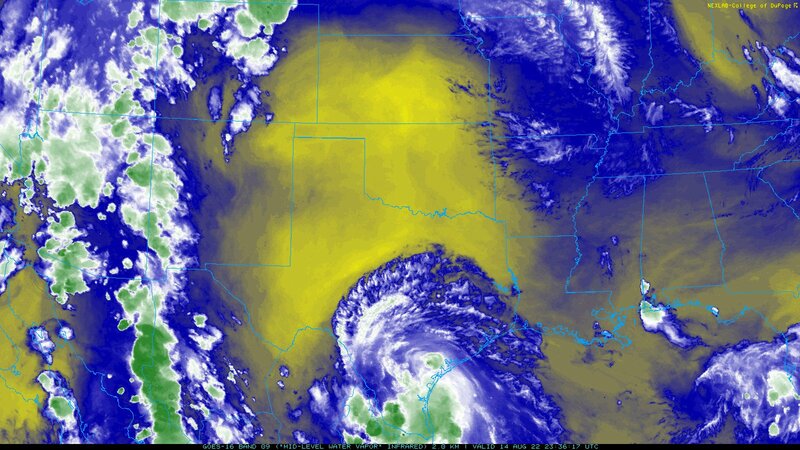 This Oklahoma satellite image displays the mid-level water vapor channel of the GOES-East satellite (Channel 9), which is typically at a pressure level around 500 millibars (approximately 18,000 feet). This image is provided by the College of DuPage and is updated every 5 minutes. The time of the image is shown in UTC time (CST = UTC - 6 hours; CDT = UTC - 5 hours). This regional satellite image displays the mid-level water vapor channel of the GOES-East satellite (Channel 9), which is typically at a pressure level around 500 millibars (approximately 18,000 feet). This image is provided by the College of DuPage and is updated every 5 minutes. The time of the image is shown in UTC time (CST = UTC - 6 hours; CDT = UTC - 5 hours). This national satellite image displays the mid-level water vapor channel of the GOES-East satellite (Channel 9), which is typically at a pressure level around 500 millibars (approximately 18,000 feet). This image is provided by the College of DuPage and is updated every 5 minutes. The time of the image is shown in UTC time (CST = UTC - 6 hours; CDT = UTC - 5 hours). 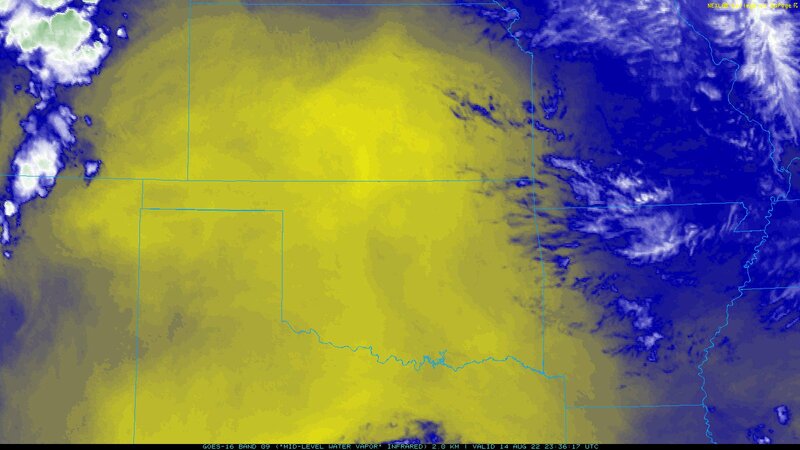 This Oklahoma satellite image displays one of the infrared (IR) channels of the GOES-East satellite (Channel 14). 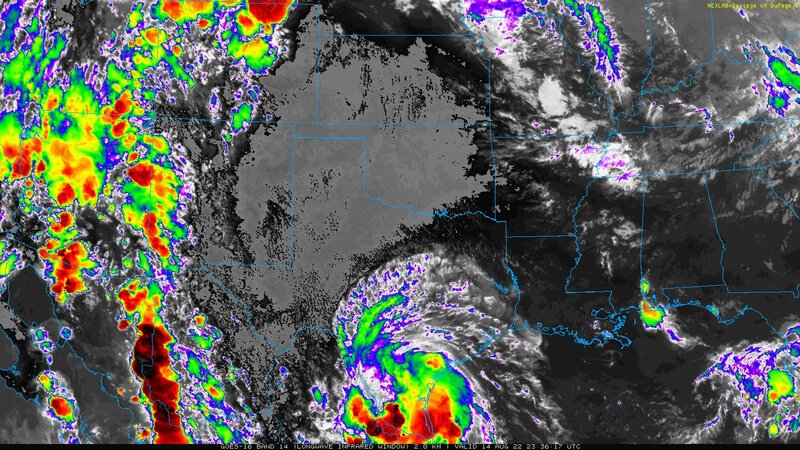 IR satellite images can show cloud coverage both during the daytime and nighttime. This image is provided by the College of DuPage and is updated every 5 minutes. The time of the image is shown in UTC time (CST = UTC - 6 hours; CDT = UTC - 5 hours). 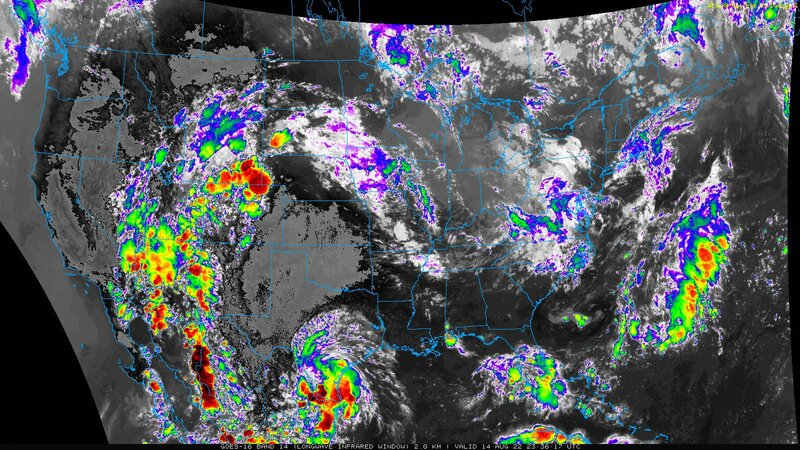 This regional satellite image displays one of the infrared (IR) channels of the GOES-East satellite (Channel 14). 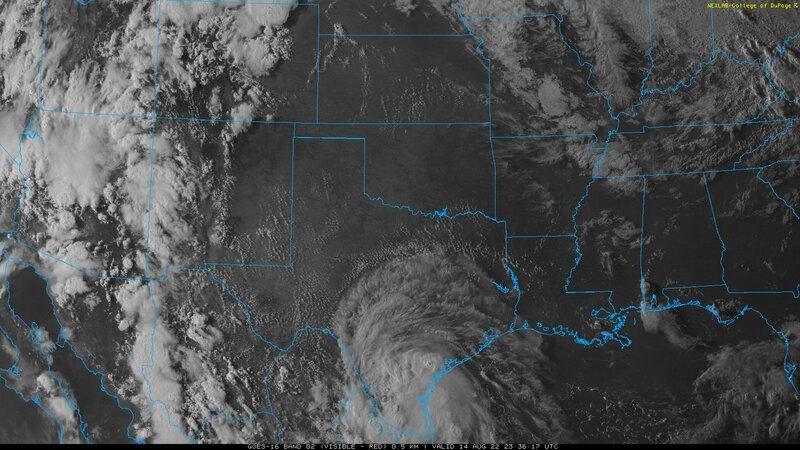 IR satellite images can show cloud coverage both during the daytime and nighttime. This image is provided by the College of DuPage and is updated every 5 minutes. The time of the image is shown in UTC time (CST = UTC - 6 hours; CDT = UTC - 5 hours). 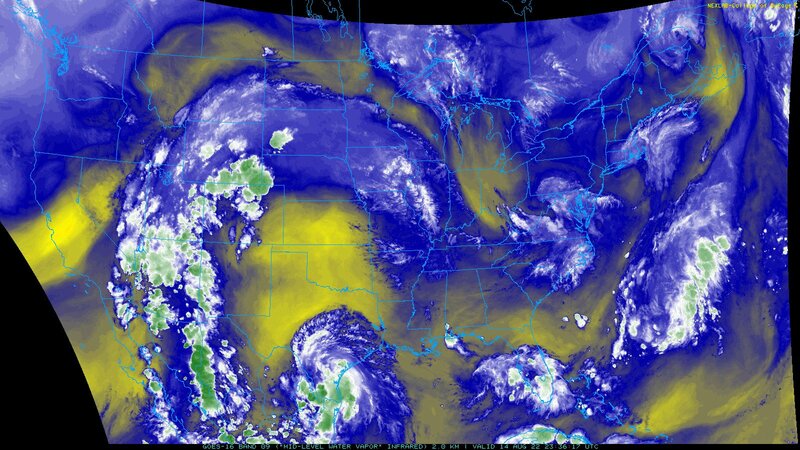 This national satellite image displays one of the infrared (IR) channels of the GOES-East satellite (Channel 14). 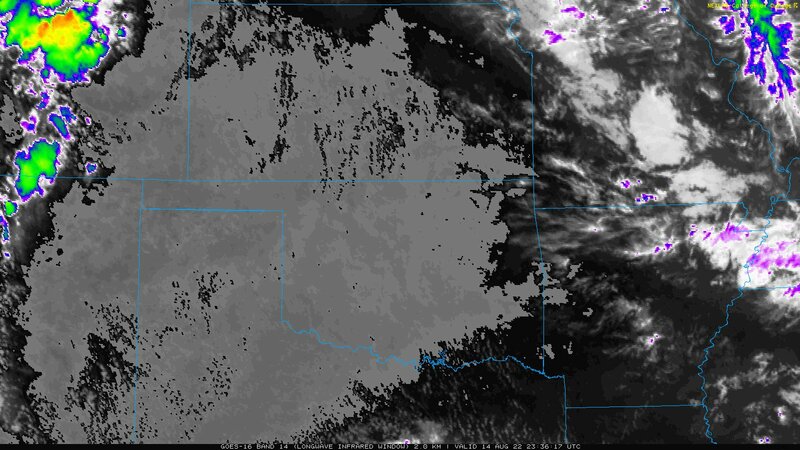 IR satellite images can show cloud coverage both during the daytime and nighttime. This image is provided by the College of DuPage and is updated every 5 minutes. The time of the image is shown in UTC time (CST = UTC - 6 hours; CDT = UTC - 5 hours).